.338 Remington Ultra Magnum (RUM) 300 Grain Nosler AccuBond- The .338 Remington Ultra Magnum is a .338 caliber rifle cartridge introduced by Remington Arms in 2002. It is a beltless, rebated rim cartridge based on the .300 Remington Ultra Magnum case shortened .090″ and necked-up to accept a 0.338-inch (.338 caliber) bullet. The .338 Remington Ultra Magnum has a similar case capacity as the .338 Lapua Magnum and somewhat lower than that of the .338-378 Weatherby Magnum. It is one of the most powerful .338-caliber rounds in production. The .338 RUM is a well balanced cartridge ideal for hunting large bodied game at close to extended ranges. There is a great deal of interest in .338″ caliber cartridges for long range shooting as well. This is specifically due to high BC mass produced bullets available. While it takes a great deal of powder to push a 250gr to 300gr bullet at acceptable velocities for long range shooting, the performance has trumped the cost in the minds of many shooters (not to mention military and law enforcement world-wide). While 225 grain projectiles have become more popular in recent years, the 300 grain bullets are ideal for large animals such as elk, moose, and the big bears—if one can tolerate the recoil. 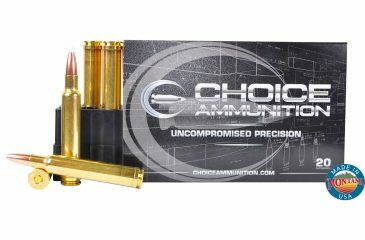 Choice Ammunition has taken our 100% hand-loading techniques and produce an extremely accurate, highly dependable round for the 338 Remington Ultra Magnum in this load. Our loading tolerances are only matched by passionate hand-loaders in their own loading rooms. Consistent seating depths, powder charges and proprietary formulas of Choice Ammunition, make this 300 Grain Nosler AccuBond round the best you can buy on the commercial market today.